We know you’re taking shots. Lots of them. We know you’re winning and helping the world win. We see your great work. Now let everyone else see it too. 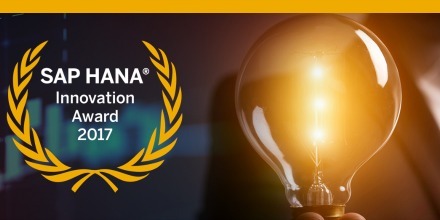 Enter the 2017 HANA Innovation Awards. Tell us your #InnovationStory. Are you innovating and are your customers innovating with you? We want to know. Every year, The HANA Innovation Award gives real companies the opportunity to tell the story of how they help the world run better with SAP. This year, there will be two tracks: customers and startup/partners. The scope of the awards has been expanded and participants from any eligible organization leveraging any SAP Platform and Technology can enter for a chance to win. In addition, special awards will be granted to honour at least one of the HANA Innovation Award Digital Trailblazer category entrants. The Industry Disrupter Award will recognize entrants that epitomize how digital transformation is radically disrupting how an organization creates value, interacts with customers and business partners, and, changes the competitive landscape. We want to hear your #InnovationStory. Here’s how to get your story heard. Select your track: customer or startup/SAP partner and then choose a focus area from the available categories below. Categories are the same in each track. Entrants may submit one customer track entry and one partner track entry for a maximum of two total entries to the program. Each track entry may be in different categories. Customer Track: Entrants must present solutions that have been deployed at and for the benefit of themselves (they are the customer) or at and for the benefit of another company for whom the entrant was the implementation partner (the other company is the customer). For all entrants in the customer track, the customer (who may or may not be the same as the entrant) is eligible to be named as a winner. Partner Track: Entrants (who are assumed to be the same as the partner) must present solutions involving commercial business applications that they have developed on top of one or more SAP Platform and Technology solutions and that are intended to be sold to and used by the entrant’s customers. The entrant’s business application does not need to be in production or “live” at a customer site. However, the entrant may reference and include details and results from customer deployments in their entry with that customer’s agreement. Yes, I want to enter, tell me how! Prepare your pitch deck and submit your entry form. You must complete all fields in the form to qualify and your entry must be in English. Additionally, you must affirmatively declare the track and category for which the entry is being submitted. If an entry is incomplete or does not comply with the specifications and rules, it will be disqualified. Human impact: To what degree does solution impact society, people, employees and customer’s lives and businesses? Business or social value created: Based on the selected entry category, to what degree does the solution create business or social value? Creativity or complexity of the use case: To what degree does the entry demonstrate innovative thinking, creativity and complex application of technology to business challenges? IT impact: To what degree does the entry demonstrate innovation in the design and architecture of the solution? Entry fit with Category: To what degree does the entry exemplify the criteria for the selected category? For more information on the HANA Innovation Awards timeline and list of prizes, read this blog. Be sure to catch this webinar replay for more details and read our three tips to win. Participation period is open and entry submission has already begun. Get started today and remember to join the #InnovationStory conversation. For more Innovation stories, follow me on Twitter @SuzyKim and join me on LinkdedIn.